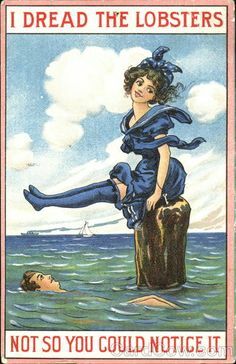 Research indicates this card was published around 1910; it is a pre-linen, white border card. It was published by the H. H. Tammen Company, which used a squatting “Primitive” (that is, Native American) as its logo. Time magazine wrote an interesting article about Tammen in 1927 (Tammen had died in 1925) which describes his beginnings as a waif, then saloon cuspidor (presumably, the kid who empties spittoons rather than acts as one), then bartender; he later befriended Fred G. Bonfils, a rich cousin of Napoleon, and squeezed enough money from Bonfils to buy the Denver Post. He then proceeded to maintain a near monopoly on the news (and the advertising revenue generated) for the entire American West until his death. The article does not mention any other publication ventures like postcards, but there are plenty of cards stamped “H H T CO” out there; most of the ones I have seen have Native American culture as their subject matter. This postcard was postally used some 35+ years after its publication, on May 11, 1946. Postmarked at False Pass, Alaska, it was sent from one Mrs. A. Newman to our friend Kay Anthony: “Hello. — Your card was lovely. You can send any kind of card.” Clearly this was another of Kay’s postcard trading partners; I still wonder how they found each other back then. 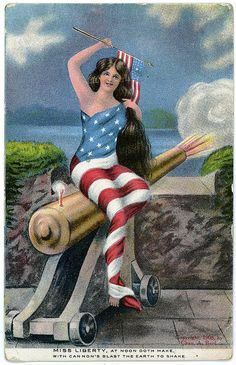 Today we have online resources like Postcrossing that let us trade around the world; Kay’s correspondents seem to have been confined to the United States. Also of interest is Thlinget (now spelled Tlinget) culture. (You can see a turn-of-the century photo of Chief Kian’s totem pole here.) From the perspective of U.S. history, they had a few early encounters with Europeans, but most of their earliest dealings were with Russians. Misunderstandings with the Russians culminated in the Battle of Sitka, in which the Russians displaced them from much of their land. When the Tlinget shamans couldn’t cure smallpox, brought to them by the Russians, the Tlinget converted to Orthodox Christianity, also brought to them by the Russians. There is a movement today among younger Tlinget to bring back the old gods, but older Tlinget want no part. Also of interest is the fact that the Tlinget had kept slaves; when the United States purchased Alaska in 1867, emancipation was enforced, and the Tlinget demonized Abraham Lincoln.